Anyone with an eye for style and quality must check out these guitars when considering their next top-end purchase. French chic mated to exemplary craftsmanship; familiarity and originality in equal measure. High action on Jet is surely an aberration; that the cheaper ranges could obscure the greatness of Lag's Mastershop models. 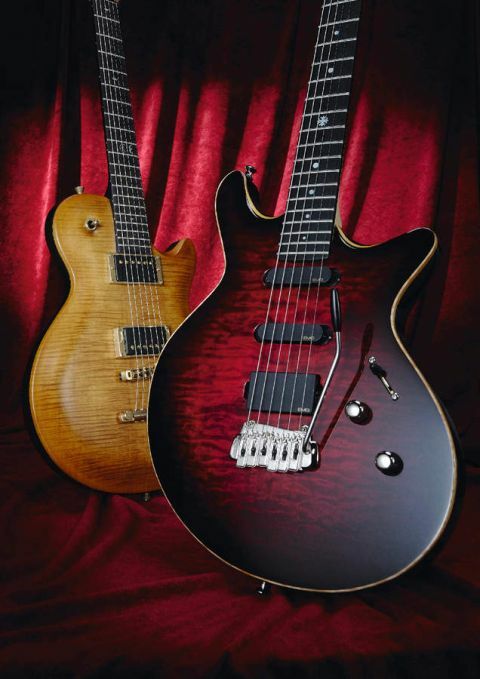 Lag's Imperator (left) and Jet (right) guitars. The two-tone stepped headstock is a stylish addition to the Jet. Many readers would be forgiven for thinking that Lag is a new name on the guitar scene and that the range slugs it out at the bottom end of the market with other brands spewing out of Asia. But Michel Lâg started his company more than two-and-a-half decades ago, building low-production, premium models that were played by the likes of The Scorpions and Motörhead. The bolt-on-neck, double-cut Jet with H/S/S pickup layout owes something to Fullerton - or perhaps Music Man's home in San Luis Obispo. Looking like a cross between something that Music Man and Brian May might have conjured up, Lag's Mastershop Jet is small, but beautifully proportioned. Designer Lâg has ensured that it looks good from any angle, with interesting three-dimensional details like the two-tone 'stepped' headstock design, Dali-esque 'down-turned' lower horn and revealed white maple faux binding around the edge and repeated in the elegantly chamfered cutaway. "The Jet is our most versatile guitar, for the guitarist who needs crystal clear single-coil type sounds together with warm and deep humbucker features," says Lâg. "This guitar is not a compromise. The EMG pickups give each situation a precise and efficient answer, from big distortion to the clearest tones and all the various crunches in between, thanks also to a warm mahogany body enhanced by a thin figured maple top. Here you can definitely change your sounds without changing your guitar!" Again you have to agree. In fact the Jet looks better in the flesh than in photos, due to the fact that Lâg has thought of it as a wholly three-dimensional thing, and viewing it from every angle provides you with a great deal of visual satisfaction. The headstock is a perfect example, with its deep scoop behind the nut and two-tier 'stepped' design - the main section in body colour and the logo appearing on white maple. Similar to the body, it's pseudo bound too. The Jet is a 'bent' or 'drop top' design where that "thin figured maple top" follows the body's forearm contour. Tom Anderson pioneered the idea and it's elegant luthiery in action. The Jet is built to Lag's impeccable standards and looks fabulous in this dark cherry finish that bursts ever so slightly towards the middle. African mahogany is the body timber choice. It's just visible under a dark brown, flawless finish and shows how neatly the area behind the neck heel has been scooped away for better top-end access. The neck is bolted to the body with four screws set in chrome ferrules, but Lâg's 'piece de resistance' is the titanium 'alignment rod' that sits in a slot in both neck heel and body, tying the two together for improved side-to-side stability. Turn the Jet over and the attention to detail continues: the control and vibrato cavity - and the battery compartment for the EMG 'Luke' pickups - are exquisitely inlaid. You really can't fault these guitars' construction - it's as good as anything else that we've seen. A maple neck houses 22 frets - the last of which sits on a body overhang. Again the fretboard is ebony and this time pearl dots are complemented by a tasteful 12th-fret snowflake inlay. Like the Imperator, the 'board is bound in ebony for the neatest of fret-ends. Remaining hardware includes strap-locks and a beautifully engineered Wilkinson designed/ Gotoh made VS401 vibrato that Lâg renames the 'Absolute'. This is said to retain vintage tone while offering all the facilities of a modern vibrato bridge. It certainly looks the part and its sweeping design somehow suits the Jet better than anything else we could imagine. A high action let this particular Jet down. A few minutes on the bench would sort things out, but it seemed at odds with everything else about these instruments. Neck-wise it's very like the Imperator, with a medium 'C'-shape that does the job in fuss-free style. Bigger frets may have seemed more attuned to the guitar's 'rock' flavour, but once the action was reset we had no qualms about the Jet's playability. EMG pickups have a clarity that makes them perfect for high-gain applications, or where lots of effects are being used. No wonder then that so many top players use them - metal man Kerry King, Aussie country ace Keith Urban and of course Toto genius Steve Lukather among them. And it's a set of H/S/S Luke pickups that grace our Jet. It's a great set of tones, actually. EMGs excel at those 'hollow' in-between sounds and here positions two and four are extremely vocal - the middle and bridge being particularly good for 'vowelly' lead tones and the neck and middle option redolent of Knopfler in his Pensa Suhr days. The bridge humbucker on its own is a bit of a beast and through our Cornford Carerra test amp it sings like a bird. And just try not to sound like Gilmour when in neck pickup mode! This is a thoroughly modern guitar that, while nodding in various other manufacturers' directions, retains the individuality that Michel Lâg strives so hard to maintain. "My wish is always to be original," concludes Lâg. "There are so many copies of 'Old US Ladies' on the market, so the Jet is our French way to go into the 'single-coil' and 'bolt-on neck' area - but with contemporary specs, elegance and originality." You're not wrong, Michel!